Adobe Illustrator CC has been a powerful design tool for quite some time, and the folks at Adobe continue to impress me with each new update that is released. 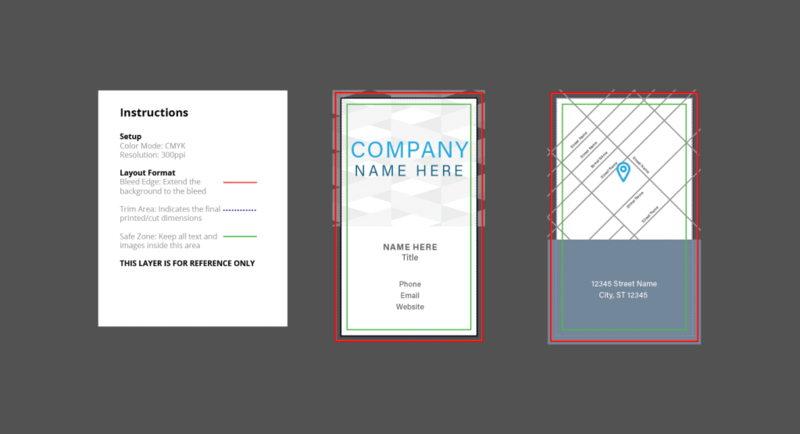 One of my favorite new features from Adobe Creative Cloud is the ability to design faster with print templates for custom business cards, brochures and flyers, postcards, invites, posters, letterhead and more. In this blog, I’m going to feature some of my favorite designs currently included for free use with your Adobe CC membership. You can access these design files by opening the most current version of Adobe Illustrator CC and clicking on “Print” in the new document window. This 2″ x 3.5″ Simple Business Card template designed by Owen Jones offers a clean design with four accent pattern swatches available. Various business card templates are available, but this one stood out as one of my favorites. 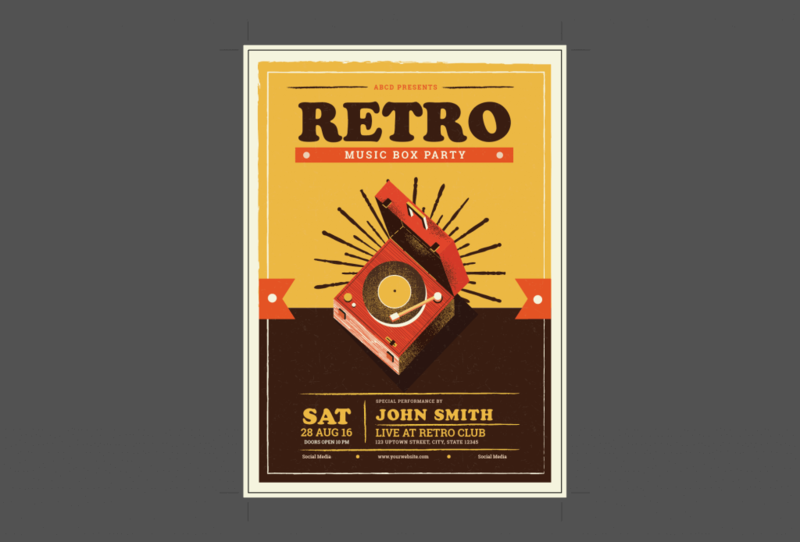 This 8″ x 11.5″ “Record Player Flyer” template designed by Guuver has fully editable vector graphics as well as editable text. A variety of flyer design templates are available, but this one really impressed me. 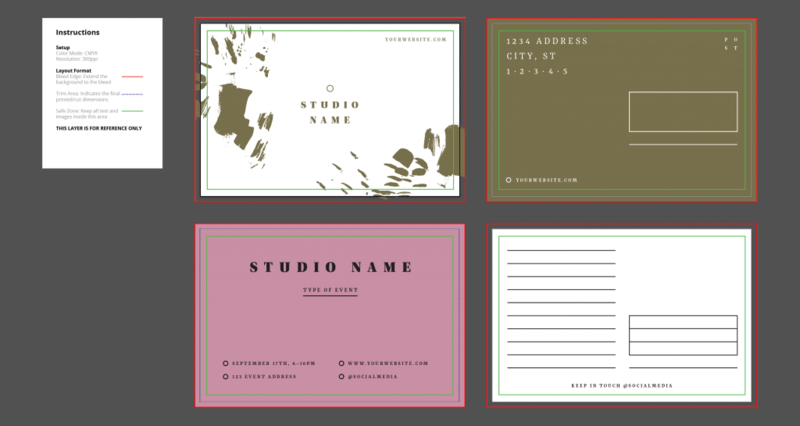 The “Bold Postcards Set” by Hands-On offers 4″ x 6″ postcard layouts with bleed. There are 4 available front designs and 4 available back designs to choose from. One of the awesome features of these templates is that they come with easy-to-understand instructions and the files are already set up to meet print requirements. The fonts used in the designs can all be synced from Typekit. The files are set up in CMYK color mode, and the artwork is at 300dpi and that includes bleed. The bleed for each file varies, but you can adjust the bleed to 0.0625″ on all four sides by clicking on file > document setup > bleed. So, you just need to fill in the information you would like to have printed in the provided fields and save for printing. Check out the above designs and all the other available free templates by opening the latest version of Adobe Illustrator CC and clicking on “Print” in the new document window.